In this 2017 file photo provided by the NFL, Julian Edelman accepts an award on behalf of Tom Brady. Edelman was visiting Bangor Tuesday night. BANGOR — Evenrood’s, a restaurant-bar in downtown Bangor, had a celebrity dine in its establishment on Tuesday night. New England Patriots wide receiver Julian Edelman, who missed the 2017-18 season due to knee surgery to repair a torn anterior cruciate ligament, ate in the Vault Room with a small group of friends according to Evenrood’s owner Lisa Leonard. The 5-foot-10, 200-pound Edelman has spent the last nine seasons with the Patriots after being drafted in the seventh round of the 2009 National Football League draft out of Kent State University in Ohio. Leonard said she didn’t know why he was in Bangor. “He seemed nice. We asked him if we could get some photos with him and he said, ‘Let’s do it,” said Leonard. Interestingly, the server for his table was former Husson University of Bangor wide receiver and Bangor High football star Josiah Hartley. The 31-year-old Edelman, a native of Redwood City, California, has caught 425 passes for 4,540 yards and 24 touchdowns during his nine years with the Patriots. He has also returned 157 punts for 1,832 yards and a franchise-leading four touchdowns. He also has the Patriots record for longest punt return for a touchdown, 94 yards. He has returned 29 kickoffs for 607 yards and he has also carried the ball 39 times for 257 yards. He has caught at least 92 passes in three of the last four seasons. The caught only 61 passes in 2015 because he missed the last seven games due to a broken bone in his foot. 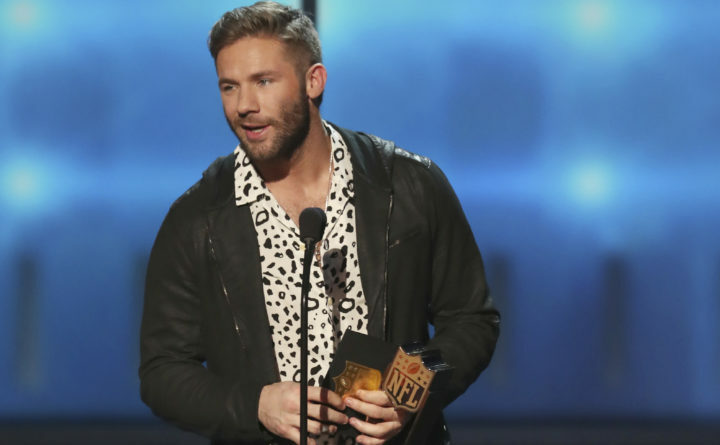 Edelman snared 98 passes for 1,106 yards and three touchdowns in 16 regular season games during the Super Bowl-winning 2016-17 season; 61 for 692 yards and seven TDs in his abbreviated 2015-16 campaign; 92 for 972 yards in 14 games and four TDs in the 2014-15 season in which the Pats won the Super Bowl and 105 for 1,056 yards and six TDs in 16 games in the 2013-14 season. Edelman has had two memorable Super Bowls. He had five catches for 87 yards and returned three punts for 40 yards, including a 26-yarder, in the record-breaking come-from-behind 34-28 overtime win over Atlanta in the 2017 Super Bowl. New England overcame a 28-3 deficit making it the most dramatic rally in Super Bowl history. During the 28-24 Super Bowl victory over Seattle in 2015, his nine catches for 109 yards were both game-highs and he also caught a TD pass. He had three punt returns for 27 yards.